Texture Jewelry - This is a classic handcrafted sterling silver pendant that features a freshwater cultured black round pearl (8mm). This delicate, but showy necklace comes with an 18" snake chain. 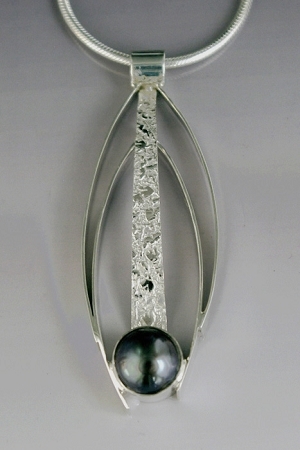 A Sterling Silver modern pendant with a large fresh water black pearl. The pearl measures approximately 8mm in diameter. The pendant had tectured silver and contrasting high polished silver and includes an 18" long Sterling Silver snake chain. Designed and signed by Aaron Rubinstein and handmade by Modern Art Jewelry.